The long history of Cremona can be read in Wikipedia. This site's concern is with a brief Golden Age of music when the happy combination of a beloved native son, widespread community support, and a group of exceptional musicians. 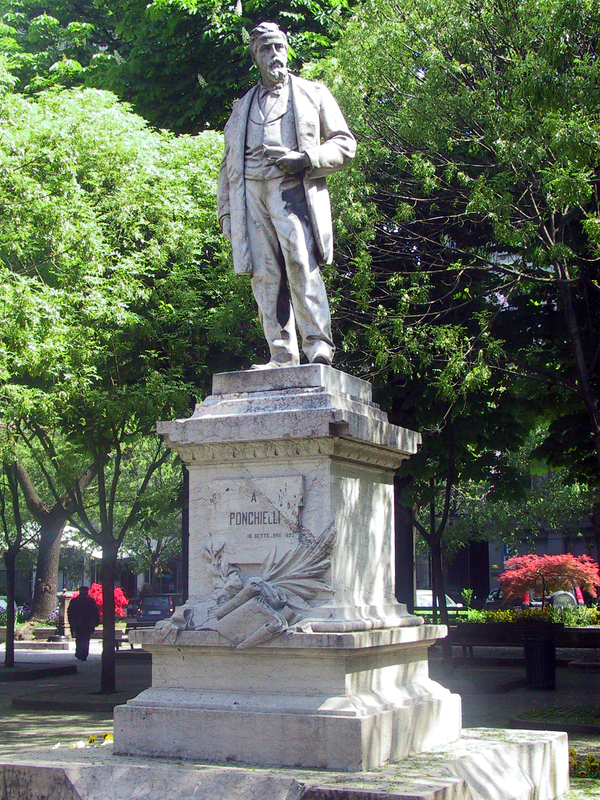 Anyone visiting the city today can experience much of how the city was when Ponchielli was its bandmaster. Sadly, many people who enter the Piazza Roma and sit under its trees on the benches have no idea who the portly middle-aged gentleman whose statue graces one end of the park is. Contemporary accounts of the effect of his death on this community can be described in only the most devastating terms. His success was their success, and his premature death from pneumonia was profoundly shared. For eight years, he was the community's pride and chief source of free music. For those who could afford it, his funeral marches buried their dead, young and old - important and obscure. The twice-weekly concerts included popular dance music to which many may have courted their spouses and comforted their children. So profound was the residue of his influence that the centenary of his birth (1934) was an occasion of great remembrance. Sadly, little was made of his career in Cremona, a slight this site hopes to correct.